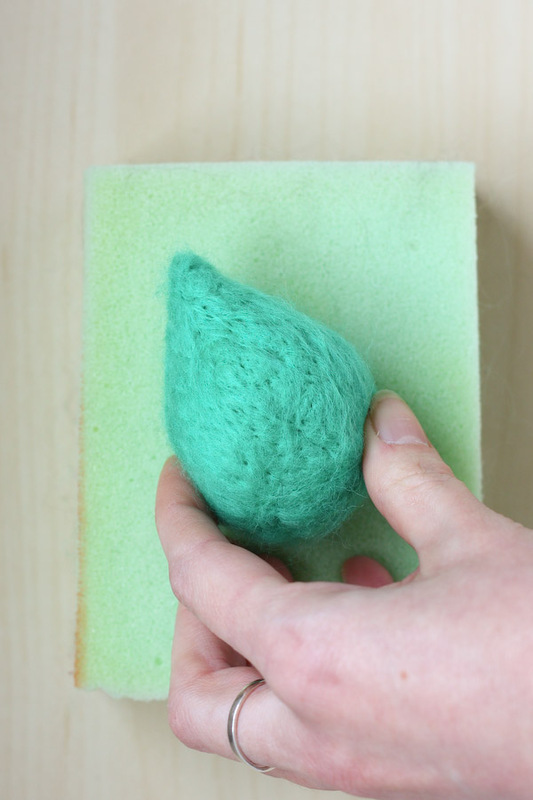 After I had made the fluffy pom pom DIY a couple of weeks ago, I realised that I had never done a needle felted decoration tutorial, despite my Needle Felted Bunny DIY still being really popular. So I am fixing that with these retro style baubles (or ornaments for the Americans among you), decorated with seed beads. 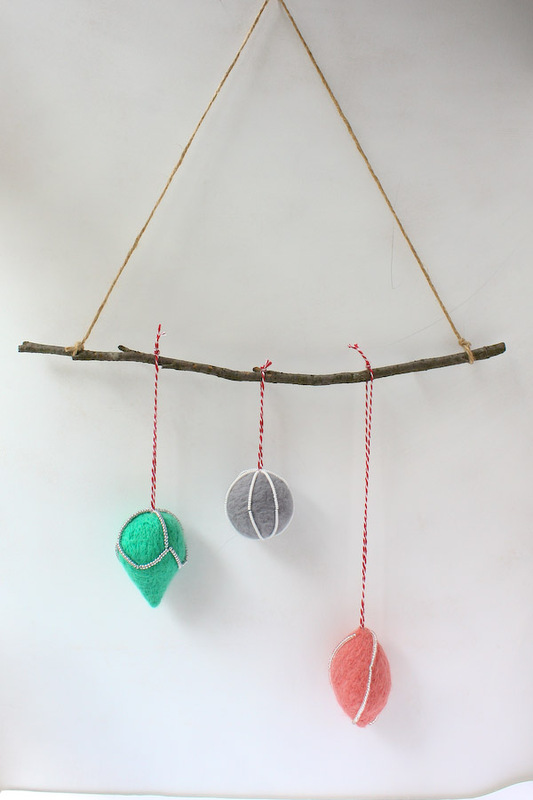 You can customise the colour and embellishments to fit in with your existing style; red wool and white beads for a Scandi theme? Classic red and green with gold beads? Or go fun and colourful like me! 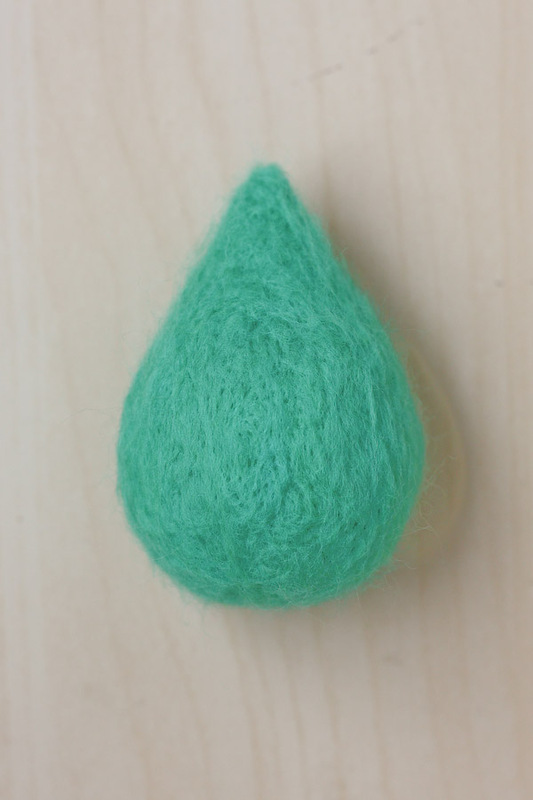 If you have never needle felted before, pop on over to my basic needle felting guide before continuing, or if you just need a refresher! 1.We are going to make a core using a flame retardant toy filling (lambswool is a natural alternative) before covering in our wool roving. 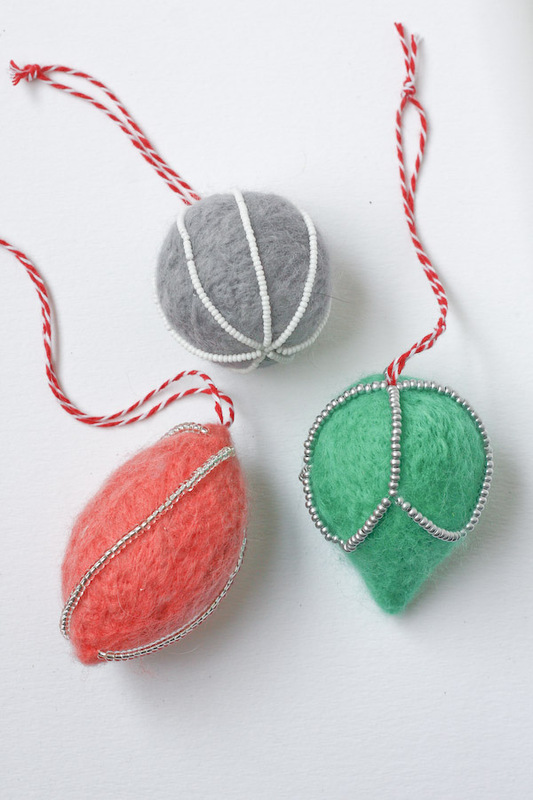 Take a small handful (about 5g) of toy filling and loosely needle felt into a ball as you would for normal wool roving (see here for a tutorial). You just want it to hold its shape, but not be firm and you should end up with something approx 5cm in diameter. FYI Synthetic filling comes together much, much quicker than natural wool! 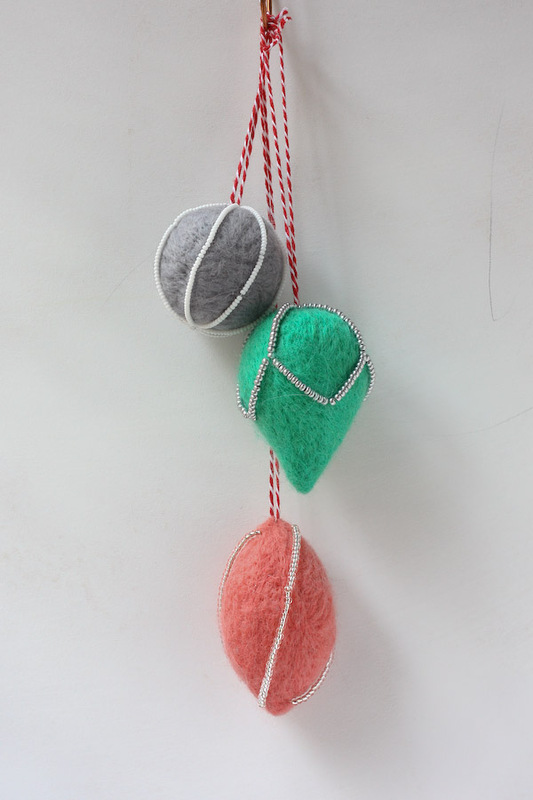 2.Pull out a small amount of your coloured wool roving and separate into 2 strands. Tightly wrap one way around the core, then the other, covering the surface. 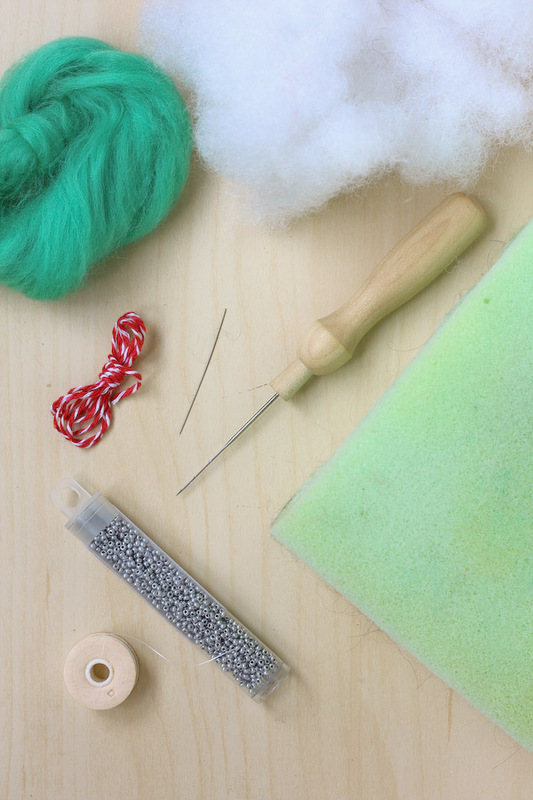 3.Begin to needle felt evenly all round, turning the piece to maintain the round shape. 4.Once you are happy the wool is attached, roll it between your hands to make a more oval shape, then pinch one end to a slight point. Begin needle felting all around this point, avoiding the tip, until it becomes more defined. 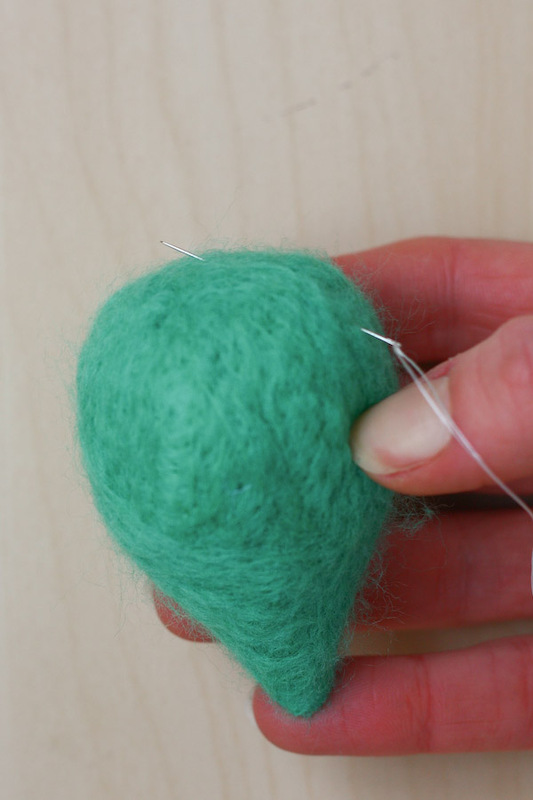 5.Keep moving the piece round, so you needle felt evenly. If you notice the point going off in one direction, felt on the other side to bring it back! 6.Once you are happy with the point, make sure the rest of the shape is nice and even, without any loose fibres. You can use a finer felting needle like a 38 gauge star shape to get a smoother finish at this point, but it isn’t necessary. 7.Thread your beading needle (size 10 needle works well for size 8 beads) with an arms span of beading thread, and tie a knot in the end. Because the felt shape is fibre all the way through, we can just sew right through it, so take the needle in one side and aim to come out directly opposite the point. Leave the tail loose. 8.Now stitch on sections of seed beads (I’m using size 8’s) in whatever pattern you like! I used rows of 18 size 8 seed beads formed into a cross pattern over the rounded end, then rows of 12 size 8 beads formed into points. If you only using short sections of beads, I don’t think you need to secure them using a beaded backstitch or couching stitch. If you want long sections going from top to bottom, then I do recommend it. 10. To finish off, stitch the thread through the decoration a couple of times, cut off the excess, then lightly needle felt over the area. This will felt the thread into the core filling. Repeat with the thread from the beginning. 11.You can vary the shape by making a point at both ends or just creating a classic round shape. 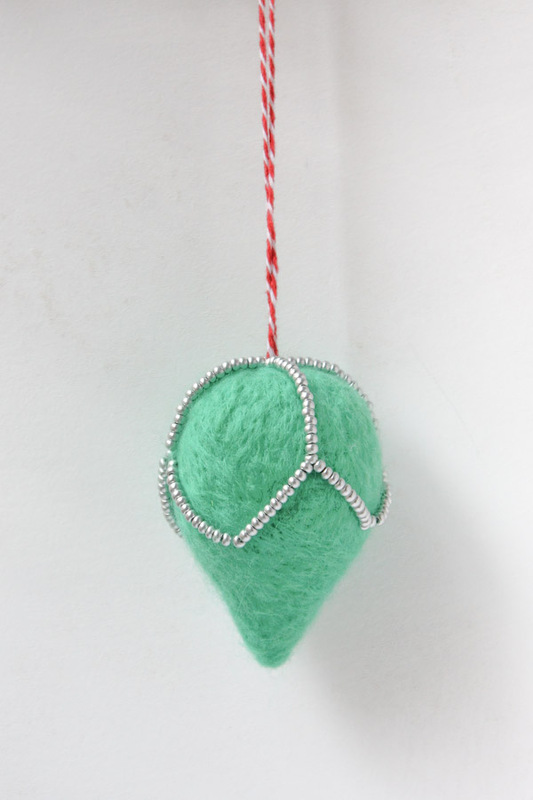 If you have a go at making your own Needle Felt Christmas Decorations, or have any questions feel free to comment below or message me on Twitter, Instagram or Facebook! Happy Making!